Our founder, Pierre Bienvenu Noailles, was born in Bordeaux, France, in 1793, at the height of the reign of Terror that followed the French Revolution. He grew up in a closely-knit family surrounded by loving brothers and sisters. He was a lively child and had a turbulent adolescence. A brilliant young man who succeeded at everything he undertook, he could have had a great career in a number of professions. But God entered his life at the age of 19; he made his First Holy Communion at the age of 20 and entered the Seminary in 1816. Fr Noailles had a special devotion to both the Holy Trinity and the Holy Family of Nazareth. He responded to the call to renew the Church of his time and lived a spirituality which sought God alone in all things like Jesus, Mary and Joseph. 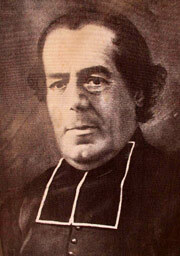 Fr Noailles died in 1861, after a life lived in service of God and the poor. His holiness showed itself in the ordinary actions of everyday life and in his constant and burning desire to conform his life to that of the Holy Family of Nazareth who loved, served and sought God alone in all things.